Teaching about insurance can get a bit intense and to be honest, sometimes boring. 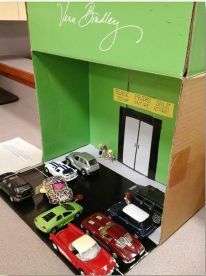 In order to make the insurance unit a little more exciting and hands on, I had students create 3-D scenarios and scripts as though they were pitching new material for an insurance advertisement similar to All State’s Mayhem commercials. Students created some humorous, yet realistic scenes and then rotated through the stations to apply their insurance knowledge. How do you make teaching insurance more interesting and fun? Share in the comment section below. Note: Prior to this project I used the free teaching materials found at Take Charge Today to teach students about the Types of Insurance. After creating an account, you can access lesson plans, Power point presentations and student materials such as handouts, worksheets, projects, etc. Ask students if they have ever watched a “Mayhem” commercial. Most probably have, but there might be a few that have not. To introduce or refresh these commercials, I like to show parts of this clip. Most students find these commercials to be funny, but understand the importance of the message behind them. Materials for scenes such as Lego’s, blocks, action figures, Polly Pockets or Barbies, little cars, houses, animals, etc. Display base such as wood boards, shoe boxes, cardboard, etc. Students will form groups of 2-3 depending on class size, however if a student wishes to work alone, I do allow it. Each student will brainstorm some original, creative, humorous storylines and the insurance types that will be included for the project. Together they will share ideas, and select the best one. Students will keep their ideas a secret as they will be used in the interactive part of the graded assignment that incorporates their notes and knowledge of the insurance types. Once the topic has been selected, students will write the scenario/script for the commercial, making sure to include the characters, setting, and props necessary to recreate/construct the idea. Students will provide me with a key of their depicted insurance types. Project samples are included below, however, due to the size of the pictures in the PPT, you may have to enlarge them to get a better view. Outside of class, students will construct the actual 3-D accident scene using things from home or the childhood such as toys. Scenes will be due and brought in on an assigned date. Scenes and scenario/scripts will be placed in stations around the room. Students will circulate and complete the Mayhem Stations form, identifying the insurance types being represented, as well as safety measures that should have been taken to avoid the accident. Students will also identify the specific type(s) of insurance(s) they should have for this situation. A class discussion of the scenes, insurance types/coverage and safety measures follows. My senior students LOVED this activity. They loved being creative and the flexibility of the project. Thank you!